Southampton travel to Liverpool in Saturday’s Premier League action. We take you through our match preview and betting tips for the fixture at Anfield. 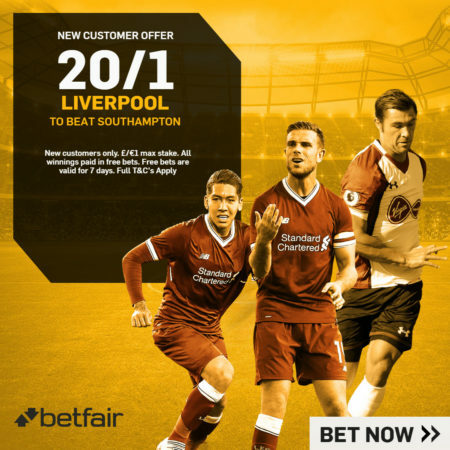 Southampton have a somewhat surprisingly strong record in this fixture – unbeaten in the last five meetings and not conceding a goal in any of the last four. Both league meetings last season ended scoreless while the Saints won each leg of their League Cup semi-final 1-0. The South Coast side are also unbeaten in each of their last three trips to Anfield, having also held Liverpool to a 1-1 draw in October 2015. Four of the last seven Southampton goals in this fixture came through Sadio Mane, who has spent the past 15 months at Liverpool. Only five clubs have conceded more Premier League goals than Liverpool (17) this season. However, the Reds have the second best home defensive record in the league – only 1 goal conceded in 5 outings, bettered only by Manchester United. Jurgen Klopp’s side have won three games in a row after only triumphing in two matches from their last ten in all competitions. Southampton are one of eight Premier League teams to have scored fewer than a goal a game in the Premier League this season (9 in 11). Liverpool are without Sadio Mane (hamstring), Nathaniel Clyne, Danny Ward (both back), Adam Lallana (thigh) and Adam Bodgan (ACL knee), while Jordan Henderson (thigh) is also a major doubt. The Saints have a major doubt over Mario Lemina (ankle) while Jeremy Pied (knock) is the only confirmed absentee for the visitors. Recent results between these sides suggest there is great value in Southampton taking at least a point from this fixture. The first weekends back after an international break are arguably a good time for underdogs as their opponents momentum will have been broken up, whilst Mane will be a big miss against his former club. Liverpool are unbeaten at home this season but already have been held by Manchester United and Burnley, where old fallacies were exposed. The Saints are tough to beat and have only lost once on their travels this season and will likely to make this a tight, low-scoring affair. Despite the home side’s defensive problems, their goals against record at Anfield is strong while the Saints struggle to score goals. Mauricio Pellegrino’s side’s strength lies in their solidity and being tough to break down and once again they are likely to sit deep and attempt to stifle and frustrate the hosts. The Saints have four consecutive clean sheets against Liverpool and are likely to play for a fifth.